This article was originally published on War on the Rocks on 14 September 2016. India’s Kashmir Valley has been the scene of a Pakistan-backed insurgency since the 1990s. The Indian army and its associated security forces have been engaged in fighting this insurgency and assisting the civil administration in maintaining law and order. On July 8, the Pakistani terrorist group Hizb-ul-Mujahideen’s commander in Kashmir, Burhan Wani, was killed in an encounter with security forces in Kashmir’s Anantnag district. Wani’s death plunged the state into deep turmoil, pitting Indian security forces against a large number of disenfranchised Kashmiri youth sympathetic to Wani’s anti-India resistance movement and calls for jihad. A full-blown confrontation between incensed youth and Indian security forces followed that resulted in 68 civilian deaths and over 2000 injured protestors, leaving an embarrassed Indian state facing a crisis of governance with no clear plan to prevent escalating violence. Exposing the fragility of the Indian state further, the Indian military publicly declared its frustration with political directives. In an unprecedented step, a strict curfew imposed in the Kashmir valley during Eid celebrations has renewed a fresh cycle of violence between protestors and security force, killing two protestors and injuring several more. New Delhi appears to be running out of options to de-escalate levels of violence. This precarious turn of events and the cyclical waves of violence affecting the Kashmiri state indicate that the Indian counterinsurgency approach in Kashmir is failing. New Delhi must conduct a fundamental reappraisal of its counterinsurgency strategy in Kashmir, as a predominantly military approach is unlikely to mitigate future violence. To prevent Kashmiri youth from becoming easy tools of radicalization by the Pakistani state, India should reduce its military presence in the valley, clearly separate the roles of its police and military, reformulate its military laws, and develop a robust political strategy that grants Kashmiris more autonomy and favors engagement over detachment. Since then, Pakistan has repeatedly contested India’s territorial rights over Kashmir. From the late 1980s, Pakistan placed its full weight behind supporting and financing the Kashmir insurgency by taking advantage of growing dissatisfaction among Kashmiri youth with the Indian state’s mishandling of state elections. 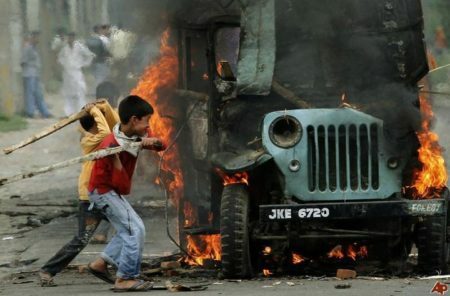 Kashmiri youth frequently opposed the Indian state in moments of severe social unrest. Yet the 2016 protests are qualitatively different from previous protests in intensity, scale, number of protestors injured, the rapid mobilization of anti-India supporters, and the sloppy response of the state to deescalate violence. This raises troubling questions for the Indian state: Why is the rhetoric of terrorist groups such as Hizb-ul-Mujahideen gaining alarming popularity among Kashmiri youth, mobilizing them in thousands? Can a larger military presence bring stability and return the Kashmir valley to normalcy? Answers to these questions require rethinking India’s counterinsurgency approach in Kashmir. In Kashmir, the shift from strictly kinetic operations to winning the hearts and minds of local populations entered the military psyche in 1998 with the launch of Operation Sadhbhavana. But a formal counterinsurgency strategy, embodied in The Doctrine for Sub Conventional Operations, was launched only in 2006. This doctrine argues for a people-centric approach and the minimum use of force. Though improvements have been made, this approach still does not define India’s operations in Kashmir overall. Rajesh Rajagopalan observes that an effective counterinsurgency strategy must focus on small-unit rather than large-unit operations, because such operations emphasize a completely different set of skills, weapons and attitudes. Yet the Indian military’s organizational culture has conditioned it to fight a conventional war with Pakistan. The training and mindset for conventional warfare still limits how the Indian military approaches operations in Kashmir. New Delhi must reevaluate its counterinsurgency strategy in Kashmir for two reasons. First, the Indian military has publicly stated that it cannot do more in Kashmir. This suggests that all military options have been exhausted and that the military understands that doing the same thing over and over again is unlikely to produce a different outcome on the ground. Northern Army Commander Lt. Gen. D.S. Hooda has urged maximum restraint, requesting that New Delhi engage various political groups — including separatists — in a conclusive dialogue. Similarly, Indian army chief Gen. Dalbir Singh has underlined the need to involve all stakeholders. The Indian army is showing signs of stress, increasingly weary of fighting a prolonged insurgency that threatens to undermine its professionalism. It is also deeply uneasy performing a job that lies within the jurisdiction of the police. Ignoring the military’s concerns will only exacerbate the political challenge for New Delhi. Second, large numbers of Kashmiri youth are being radicalized by a venomous jihadist ideology that draws immediate inspiration from terrorist groups inside the Pakistani state. Several examples point to the Pakistani government’s explicit role in aiding this process. Pakistani Prime Minister Nawaz Sharif expressed shock at Burhan Wani’s death chastising the Indian state for its “deplorable” actions. It is clear where sympathies lie when the prime minister of a country openly extends support to the leader of an internationally designated terrorist group. In May 2011, Hizb-ul-Mujahideen leader Syed Salahuddin admitted how the Pakistani military gives its fighters and those belonging to the Jaish-e-Mohammed and the Lashkar-e-Taiba complete freedom to operate. Salahuddin has repeatedly called for an armed struggle to liberate Kashmir. Inside Pakistan, Jamaat-ud-Dawa (JuD) chief Hafiz Saeed, unencumbered by the Pakistani state and exhibiting unwavering defiance, is provoking thousands to wage an armed resistance against India. Saeed is the founder of Lashkar-e-Taiba (LeT) that later renamed itself Jamaat-ud-Dawa. Armed militants are brazenly organizing processions and attending anti-India protests inside Kashmir with regular frequency. Abu Dujana, a Lashkar-e-Taiba commander,made an appearance at a protest rally recently that received very little attention in the press. Obviously, the normalization or acceptance of armed militants professing jihad against the Indian state will seriously undermine India’s national security. But a military-focused kinetic approach to fight jihadist-inspired radicalization is proving insufficient; the battle must be fought ideologically. A specialized counterinsurgency force, the Rashtriya Rifles, was created in 1990 to address the Kashmir insurgency. It was meant to reduce the burden on the Indian army but almost all its forces are drawn primarily from infantry battalions working on a rotational basis. Over the last 25 years, there have been frequent debates about withdrawing these battalions. In the last five years, the Indian army has tried to reduce its presence in towns and villages, shifting much of the responsibility to Central Reserve Police Force and Jammu and Kashmir Police. So what can be done? A revised counterinsurgency approach in Kashmir demands a combination of military and political measures with a reduced emphasis on the military component. First, it is absolutely vital to separate military and police roles. Specialized counterinsurgency forces on the military side such as the Rashtriya Rifles work within the Ministry of Defense, while the Central Reserve Police Force and Border Security Force battalions work under aegis of the Ministry of Home Affairs. The Indian army is called upon to maintain law and order only when state or local police are unable to control a festering situation. Building a stronger, more sophisticated, more professional police force better trained and equipped to maintain law and order will reduce the burden on the Indian army so it can focus on preventing infiltration along the Line of Control and strengthening its conventional capabilities. Several proposals to reform the police apparatus in Kashmir have inexplicably yet to be implemented by various political administrations. Indian security forces, particularly the Central Reserve Police Force, have drawn severe criticism for the use of pellet guns in the 2016 protests that blinded scores of unarmed protestors. But as Praveen Swami reveals, cumbersome bureaucratic procedures resulted in quashing a police request to acquire non-lethal riot-control equipment in 2012. Second, the Indian government should develop a plan that neuters the allure of jihadist-inspired radicalization. Counter -radicalization must be part of a broader counter-terrorism strategy. This, of course, is easier said than done. Essentially, it would necessitate building a structure of incentives that increases the appeal of India among alienated Kashmiri youth susceptible to jihadist ideology. Years of social unrest, instability, and incoherent political strategies have created a situation where large numbers of Kashmiri Muslims are hostile to the Indian state. This perceived alienation provides fertile ground for terrorist recruitment. The ideological appeal of militancy is derived from the sense of purpose it bestows on Kashmiri youth, mobilizing them toward a cause they believe will change the status quo. Kashmiri Muslims must believe it is in their best interest to remain part of India. While New Delhi tries to assuage the concerns of Kashmiris by engaging opposition parties in high-level talks, these high-level delegations achieve little in the absence of concrete proposals. Such acts are viewed by the opposition as largely meaningless. At the grassroots level, the state government should regularly and stridently engage with local Kashmiris, make larger investments in education, provide jobs, and increase employment. To reenergize Kashmir’s economy, New Delhi should heavily invest in the power sector, fruit processing, watershed and timber industries, identify potential investors, and open up the state to foreign economic aid. Despite the Indian army’s programs to win the “hearts and minds” of local Kashmiris, counterinsurgency is fundamentally about politics and how people are governed. As such, political institutions and leaders in Kashmir and New Delhi must necessarily lead this initiative. It must be noted here that an All-Party Delegation specifically constituted to address the ongoing protests and facilitate talks with Kashmiri political groups that visited Kashmir in September 2016 was met with resistance from separatist leaders belonging to the All Parties Hurriyat Conference and Jammu-Kashmir Liberation Front. On a much broader level, New Delhi will have to fight the dangerously noxious propaganda of Pakistan-based terrorist groups. On August 15, 2016, Indian Prime Minister Narendra Modi tried to up the ante by posturing on Pakistan’s war crimes in Balochistan during his Independence Day address to the nation. This approach is a potentially deadly gamble that could provoke Pakistan into destabilizing Kashmir further. Instead, New Delhi should continue to build on its global alliance partnership with the United States in combating terrorism as both countries face the exact same threats from terrorist groups operating inside Pakistan. In 2015, India and the United States signed a Joint Declaration on Combatting Terrorism that unequivocally outlines the threats posed by al-Qaeda and its affiliates, such as the Lashkar-e-Taiba and the Jaish-e-Muhammad. It also places significant pressure on Pakistan to bring to justice the perpetrators of the 2008 Mumbai terror attacks. India must make a concerted effort to build on these robust American initiatives that hold Pakistan accountable for providing a safe haven to terrorist groups within its borders. The August 2016 U.S.-India Strategic and Commercial Dialogue reaffirms just such a stronger commitment by both countries to fight terrorism. As part of this agreement, both sides have pledged to dismantle safe havens for terrorist groups like Lashkar-e-Taiba, Jaish-e-Mohammad, and the Haqqani network. Further, India and the United States reviewed the progress of the India-U.S. Counter Terrorism Joint Working Group meeting, held in July 2016. Both countries continue to work on various counter-terrorism initiatives that include exchanging terrorist screening information, improving coordination on U.N.-designated terrorist groups, and expediting mutual legal assistance requests. These joint counter-terrorism measures are a tremendous milestone in the India-U.S. strategic partnership and a strong deterrence against Pakistan-sponsored terrorism. Of course, working with the United States to combat terrorism cannot be the only strategy. A realistic counterterrorism approach demands that India take the lead in developing effective counterterrorism tools. A first and absolutely vital step is to set up an independent National Counter Terrorism Center which can coordinate and integrate intelligence between central and state governments. It is deeply troubling that despite being a hotbed of insurgencies and experiencing numerous terrorist attacks on its soil, India does not have a counterterrorism agency at the national level. Creating the National Counter Terrorism Center is a national security issue and should not be hijacked by partisan politics at the state level. Within Kashmir, there must be a concerted effort to clamp down on the financing of terrorist groups to dismantle their structures. The National Investigation Agency recently discovered several transactions that suggest a huge inflow and outflow of funds coming in from Pakistan. Early detection and prevention measures through enhanced intelligence gathering, providing intelligence officials with necessary surveillance equipment, and building a sophisticated system of perception management must also be an integral part of this counterterrorism approach. Third, the Modi government and successive political administrations must preserve Article 370, because India is not going to give up its territorial claims to Kashmir anytime soon, and negotiations with a variety of ideological political parties will proceed slowly. Article 370 grants Kashmiris autonomy and maintains Kashmir’s constitutional link to India, but its annulment remains a core tenet of the Modi government’s ideology. Any attempt to repeal it would only exacerbate a political crisis in Kashmir. The strength of Article 370 is the autonomous space it provides Kashmiris in governance, giving them greater control on internal matters without undue interference from the central government. Over the years, several presidential ordinances have eroded the credibility of Article 370. This is damaging not just to Kashmir, but also hurts India’s long-term strategic interests. Within the ambit of autonomy conferred by the constitution, the responsibility of greater decentralization remains with state governments. Here, the problem becomes more complex, as Kashmir’s internal politics has worked against decentralization of power at the grassroots level, with local state parties interested in pursuing their own agendas. Still, New Delhi must maintain its commitment to Article 370. Protecting the autonomy of the Kashmiri state does not in any way imply giving up India’s legal and territorial claims to Kashmir. Fourth, while not proposing a complete repeal of the Armed Forces Special Powers Act (AFSPA), amending problematic sections of this law might considerably ameliorate problems for the military, government, and Kashmiris. In 2005, the Jeevan Reddy Commission called for a repeal of the law. That proposal has been steadfastly opposed by many senior officials in the Indian military who believe the law provides a necessary layer of security in high-militancy zones to prevent the collapse of civil administration. Perhaps the most controversial parts of AFSPA are contained in sections 4, 6, and 7, which grant wide powers and blanket immunity to military and security forces to arrest individuals guilty or suspicious of terrorism without a warrant. Human rights abuses by security forces in Kashmir are a well-documented fact that significantly eroded the credibility of the Indian army and security forces over the years. Naturally, Kashmiris are unwilling to place their trust in security forces if they are seen not as liberators, but rather as violators of personal freedoms. Maintaining the credibility of the Indian armed forces and its professionalism means improving or reforming any existing legislation that undermines the military’s core values. Reforming AFSPA would also hold security forces to higher standards by shifting the burden of responsibility to those guilty of falsely accusing the military of human rights violations. These proposals are simply meant to begin a conversation on the path forward in Kashmir and to compel India’s military and political leadership to demonstrate clarity in principle and action. A military skeptical of achieving progress in Kashmir should be a red flag for any political administration. And if Kashmir is indeed an integral part of India, the commitment to it must be higher. Engagement is the only way to stabilize Kashmir and combat Pakistan’s proxy war.